The Experience app is where statistics of search phrases per market are presented and synonyms are managed. 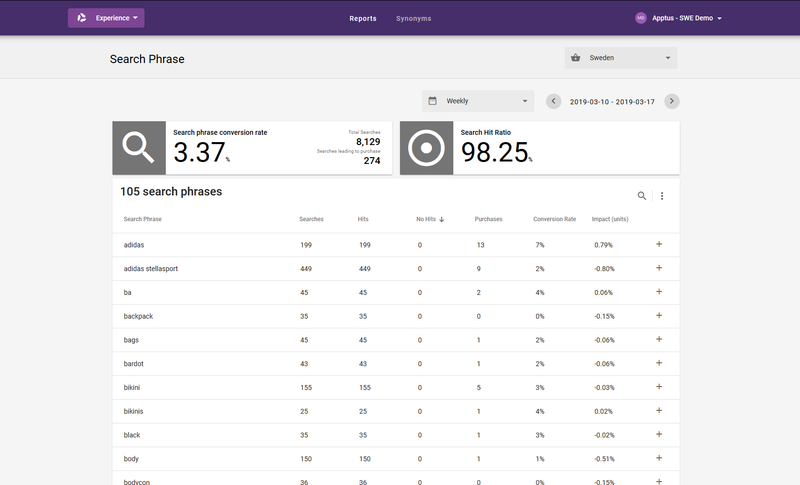 The search phrase report presents relevant statistics for each search phrase including overall search conversion rate and hit ratio. The search phrase report is a list of all the search phrases Apptus eSales currently has stored in its memory for each market, with a maximum of 100 000 search phrases stored per market. It includes statistics for number of searches, hits, "no hits", purchases, conversion rate, and impacts on units for all search phrases. An overview for overall search conversion rate and search hit ratio is available. All statistics are shown within a time interval and a market that can be easily changed. Synonyms for a search phrase can be added directly from the search results list, a useful feature when sorting by "no hits". The search phrase report can also be exported and downloaded as a .csv-file. Synonyms are used to extend searches of a phrase to include similar search phrases. A synonym includes a locale, one search phrase, and one or more synonym phrases that will be used together with the search phrase. 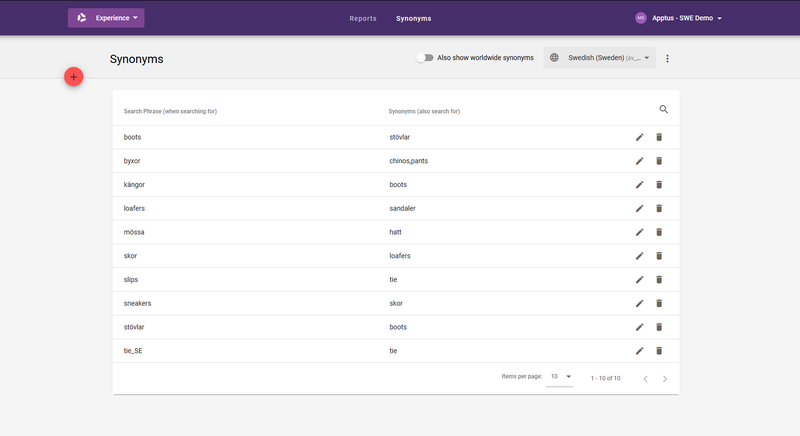 The synonyms tab allows for adding, editing, and removing synonyms for individual locales and also for worldwide synonyms (synonyms used with all locales). Worldwide editing is based on user access set in the Admin app. Excel-files with synonyms can be imported via the user interface.